The other day I was washing some chopsticks in the sink, and while rinsing them I accidentally dropped them down the drain. I think if I had been trying to do it I wouldn’t have managed to get them lined up so perfectly. When I realised to where they had magically disappeared, I couldn’t help but laugh. But this left the dilemma of how to get them out. I knew that if worse came to worse I could unscrew the pipes and pull them out, but it would be messy and require probably more strength than I have. So I got creative. I grabbed another chopstick and globbed on a nicely worked (and therefore warm and sticky) piece of blu-tack. It only took three attempts to get the first chopstick out, but the second one proved far more difficult. I brought out the hairdryer in an effort to dry the down-the-drain chopstick so it would be more likely to stick, but even this had only limited success. The chopstick would come part way up, but as soon as I started to pull the blu-tack through the drain opening the stick would drop like a stone. It was a bit frustrating and I wanted to give up, but I realised there was a good lesson in life here. I could give up and live with a chopstick in my drain, catching all the goop, and no doubt eventually blocking the drain, or I could persist and maybe succeed. I did persist and only two more attempts later I managed to snag the chopstick and pull it out. The thing is, you never know which time you will pull the chopstick up and it will hold long enough for you to get it out. The only thing you can be sure of is that if you stop trying to pull it out, it will stay there. If I keep sending out my writing, it will get picked up some time. If it stays on my computer and never sees the light of day, it will never get out into the big wide world. So, I’ll keep sending out my stories. I’ve pulled out a few chopsticks before, so I’m confident I can do it again if I just keep trying. I have to warn you, this story contains the F-word. Yes, there are farts in it. I was brought up properly, where a lady does not fart (unless asleep, but even then we deny it)… but that got me thinking about when else a lady might fart. And so A Reluctant Zombie was born. I’ve been warned against publishing this story as it has a bit of a pull my finger quality that is perhaps not becoming of my writing career. I actually sat on it for nearly two years before finally deciding to send it out. There is no deeper meaning and no call to arms to make a difference in the world. It is just a silly story, written by a silly girl in a silly mood. Sometimes I can do that. The other difference with this story to my usual offerings is that it is unashamedly biographical. The girl starts out watching my TV on my lounge, she lives with my cat, goes to my old office, and shocks my old boss. You could say it was me except for the lack of vegetables, and of course the farting. My mum brought me up right, remember. So please, if you are going to read it, say no to the plastic bag at the supermarket, take your keep-cup to the coffee shop, and please turn off your standby power equipment at the wall. My story won’t tell you to do that, so it will make me feel better if you do. I hope you enjoy A Reluctant Zombie, but please, put on your silly hat first. And no, I will not pull your finger. This is a flash fiction story which I wrote immediately after completing my novella earlier this year. It felt weird not sitting down to write after work each evening, but I knew I wasn’t ready to jump into a novel yet. Sea Canaries was my answer to winding down the writing spring of creativity that was still coiled too tightly. As soon as I read the call for submissions this story appeared in my head. I wrote the first draft in one sitting (as one would expect of an under 500 word piece) but I edited it over a period of two weeks before I was happy with it. My main issue was that the version of the story I first wrote was about 615 words long, and I had to get it under 500. I was very attached to the excess 115 words. Without giving too much away, the submission called for horrors of the deep. I wanted to write a story where the horror was coming from the deep, but the monsters were much closer to home. Later this year I’ll publish the full 615 word version on my website so you can read it as I first experienced it. I’m proud of this story and really enjoyed walking around in these skins for a fortnight, as much as I never want to live it for real. 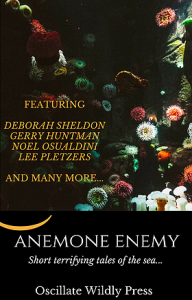 Sea Canaries appears in the Anemone Enemy and is available in both print and ebook formats. I hope you enjoy reading my story as much as I enjoyed writing it! Just in case you missed it, I had another PUBLICATION this week! It is an eco-horror tale and, as with most of my short fiction, it is aimed at an adult audience. Yet I have four completed novels and three of them are young adult. The next two that I’m planning are also YA – so why the different audience? Nearly ten years ago, when I really first started writing seriously, I noticed a change in published speculative fiction. It started to get dark. Where previously a murder was mentioned or glossed over, the books now seemed to go into a lot of graphic detail. This was the same for intimacy scenes. Where once the door was closed, now it was open… wide open. I know I might cop a lot of criticism over this, but I don’t like to write that. I don’t judge you if you like to read it, I just don’t want to. I know some of my stories, particularly the horror tales, get gory sometimes, but I like to think they never get gratuitous. I show as much as you need to get the picture. This idea doesn’t seem to sell adult books. Young adult novels are exactly what the name suggests; aimed at young adults. This means I can write adult themes, deal with mature concepts, and (even better for me) I can mash-up genres BUT I can also get away with toning down the graphic bits. I’m not saying all YA novels are soft, there are a lot of very dark, very graphic YA stories, but publishers don’t demand it of you as a writer. So I am happy to spend 60 or 70,000 words exploring my speculative theme with slightly younger protagonists than my short stories. I don’t feel like my wings are clipped at all. If anything I feel like I am able to take my writing wherever I want to go with a YA audience. It was YA that first made me realise that novels could be just as entertaining as movies. I remember reading Lois Duncan for the first time and thinking to myself ‘this is what I want to do with the rest of my life.’ It’s been a while since then, but I’m finally fulfilling that wish. Okay, so it is not actually out yet, but it will be on Friday, and I’m excited! 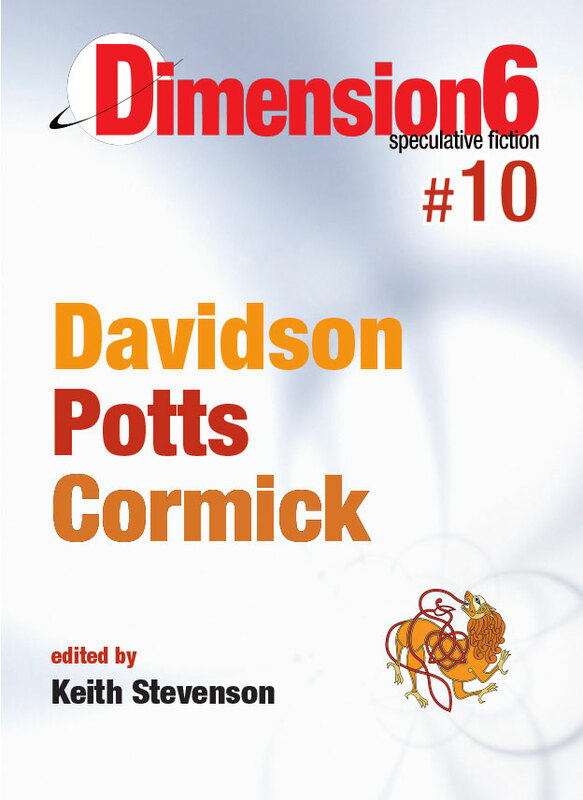 Dimension6 put out by Coeur de Lion Publishing, has included some of the biggest names in Australian speculative fiction. And I am honoured to be a part of it. As with a lot of my writing, I didn’t know what category to put this story into. I guess it could be horror, but it would be eco-horror. I’m also not sure that we’ll all be rooting for the same winner when we read it, but as long as it gets you thinking, my job will have been done. This story is very Australian, so I was glad it got picked up by an Australian publisher. The fact that it is alongside two other amazing authors is even better. I can’t wait to download my copy, and I encourage all of you to do the same, after all –it is free! I hope you enjoy Glide. And given the recent reports of sightings of Thylacines (Tasmanian tigers) on the mainland, it seems very relevant. We could be on the verge of a very exciting time in Australian Zoology! Yeah, I know it sounds obvious, but not everyone tries to get their stuff published. This can be for a number of reasons. Two of the more valid ones in my opinion are 1) if you only want to write for yourself, and don’t want others to see it, or 2) you don’t want to be told how or what to write. The editing process, when getting published, can be all about telling you what to change. So you may want to avoid that. Then there are a bunch of other reasons why people don’t get published which, in my opinion, are not so valid. Sometimes people are too lazy to read submission guidelines, so submit poorly formatted stories to completely the wrong market. Some people are terrified of rejection, so never submit anywhere, but still carry a hope of magically getting picked up. Then there are those people who have such confidence in their writing that they only ever submit to the top publishing houses or magazines. Don’t get me wrong; I’m envious of people who have such self-confidence. Most of them actually write really well, which probably bags them some jealousy points from me as well. But I believe we have to cut our teeth somewhere, and learning the ropes on the no-pay or low-pay publications is a great place to do that. Obviously I’m talking more about short stories here. If you only have one novel in you, then perhaps you need to hold onto it for as long as it takes to get the publisher you want (but even that I would question). But for me, nothing feels more writer-ly than people reading your work. If you don’t get paid for it who cares? If your reason for writing is to earn lots of money then you are chasing the wrong dream. Low or no-pay publishing opportunities are usually run by dedicated people who want you to be successful, and for that I think they deserve all the support they can get. One of my favourites is Antipodean SF. Every month Ion “Nuke” Newcombe puts out a professional e-zine of flash speculative fiction with an antipodean bent. I love it, and for as long as I write flash fiction I will be sending my stuff to him. Getting your writing published means getting it read, which can mean getting fans. When you get contacted by someone you don’t know telling you how much they liked your story, it won’t matter that you are still slaving away in the 9-5 and haven’t earned enough from your writing yet to pay for a coffee, you will feel like a writer. Very few of my stories fall out of my direct experience. Most are inspired by things I see happening to others, or wondering what would happen if things happened to others. My most recent publication was directly inspired by my old workplace. Let me start by saying that I loved working there, the people were amazing and the work was interesting. But when the market turned and the share price plummeted, rounds of redundancies became commonplace, happening every three months or so. It was a stressful time for everyone. My team went from 11 people to 5, yet we had the same amount of work to do. Everyone in my team was staying late, working from home, checking their emails on their phones at all hours of the day and night, everyone, that is, except me. When I walk out of the office, I believe in leaving the office behind. Maybe that’s why I was the next one picked to be made redundant? So because I write speculative fiction, not contemporary fiction, I decided to use a different work pressure, one that might be an issue in the future. The original title of the story was ‘Work life balance’, but I realised that I was commenting on the lack of balance. So then I decided to call it ‘Work’ but that also seemed wrong because while it was work, it was also my character’s entire life. So I ended up with the title ‘Life’ because work and life had become the one. In retrospect that is not very clear, so the title is a bit crap, but hey that was my thinking at the time so I guess I’m stuck with it. Anyway, I hope you enjoy Life – and thanks to Antipodean SF for once again picking up my flash fiction! Last weekend edition #63 of ASIM was released at Contact in Brisbane. This edition includes my story Glow, which was a runner-up in the Australian Horror Writers Association short story competition in 2014. The story was accepted for publication shortly after the competition results were announced, so that tells you how long this publication has been in the works. I’ve been trying to get into ASIM for years now, probably over 10 years if I’m honest, so it is strange to finally have achieved this goal. The irony is also not lost on me that it was with a story that was written with no thoughts of sending it to ASIM, and even now I don’t know why I did send this story to ASIM first, but I’m glad I did. Many times I’ve read advice which says purchase a few copies of the magazine you want to get into to get a feel for what they have published, then write something for them. I did this with ASIM and got numerous humours science fiction stories out of the process, but none of them found homes at ASIM. My not-funny-at-all horror story did. So yet again this seems to show that advice is not always going to be correct. Sometimes doing the ‘wrong’ thing can be exactly the right thing to do. If I’ve learned anything on this writing journey, it’s that all rules are made to be broken.